October's here! 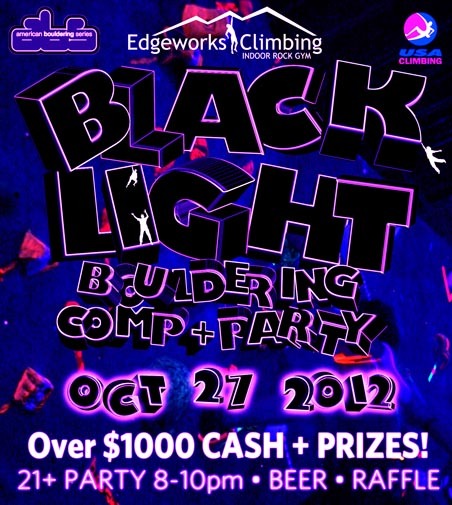 We're stoked to present the ever popular Blacklight Bouldering Comp + Party. Why should you come? For starters, the routes glow! The Blacklight Comp features awesome routes, $1000 cash prize, gear from awesome companies, and an afterhours party. Come hang out with the Puget Sound climbing community. More information, including registration forms, can be found HERE. We're currently hiring for a number of positions here at Edgeworks! Do you have what it takes to be part of our hardworking and dedicated staff? Take a look at the positions listed and see if you'd be a good match! We're looking for a Routesetter, and a Marketing Specialist. Find out more about the positions and how to apply by clicking here! Starting in October Edgeworks will be opening at 6am on Monday and Wednesdays! Come in early and get your climb on, enjoy the gym on your own terms, no crowds and take a shower before you go to work. Our new AutoBelays will make sure you always have a climbing partner so doing laps for a great morning workout is now possible! We'll see you in the morning! Don't have a partner to climb with? New to climbing? Want to get a few laps in for an intense workout? Our new AutoBelay devices are there for you! Just clip in and start climbing. Auto belays are perfect for allowing new climbers to get a feel for the movement while reducing the potential anxiety caused by learning to belay. Once a new climber is comfortable with the movement of climbing, they can move on to belay instruction and further courses. Auto belays are a great way to get “hooked”! Sometimes you just don’t have a partner for climbing. Conflicting schedules and short lunch hours can get in the way of a quality partner session. Or you might be new to the area. Auto belays provide an option for single climbers! The AutoBelay allows for lap climbing and an intense workout. At your own pace you can do lap after lap at multiple grades; start hard then finish easy, or just stay at the top level until you can't hold on anymore! Our fitness schedule has changed! Check out our fitness schedule online to see when your favorite classes are happening. Or...Check out the fitness schedule online here. Climbing is all about pushing your limits, facing your fears, and learning about what your body and mind is cabable of. In this short video, professional climber Chris Sharma talks about fears and limits and how climbing through the fear pushes you to discover more about your abilities. Looking to further improve your climbing? Check out our Private Lessons or ProRock Coaching programs. Geared towards increasing your strength and endurance, ClimbFit will improve your explosive power and help you break through your endurance plateau. Come train with other motivated athletes in a supportive atmosphere with high intensities. We are proud to now offer a Girl Scout Climbing Patch program. In the 4 hour long class, we teach all about safety, climbing history, notable females in the sport, types of climbing, local climbing areas, climbing equipment, climbing knots, team work needed to climb successfully, and much more. Host your next event at Edgeworks! We can accomodate all sorts of groups, from Military PT groups, to birthday parties, to overnight lock-ins, to team building for your office, and more! You can even rent out the entire gym for your event. Check out the entire class line up on our Climbing School page. Simply the best way to improve your game on the rock, Edgeworks ProRock Coaching is here for you. Join us Tuesdays and Thursdays either at 10:00 a.m. or 6:30 p.m. for two hours of dedicated, professional coaching. The ProRock program is just $119 a month and includes your membership! For those who are already members, ProRock is only $65/month. Learn more here. 3:00 0.m. - 7:00 p.m.